Edited by Sara J. 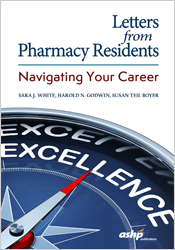 White, MS, FASHP, Harold N. Godwin, MS, FASHP, FAPhA, and Susan Teil Boyer, MS, FASHP, this book is the latest addition to ASHP’s Letters series, a one of a kind road map to the pharmacy experience. Letters from Pharmacy Residents joins Letters to a Young Pharmacist: Sage Advice on Life and Career from Extraordinary Pharmacists and Letters from Rising Pharmacy Stars: Advice on Creating and Advancing Your Career in a Changing Profession, as part of a growing collection of personal letters created to inspire and comfort pharmacists through all stages of their professional journey. Each chapter is a personal letter to the reader, filled with practical advice and insight on a wide range of experiences. More than a book, Letters from Pharmacy Residents is an essential guide to navigating your life and pharmacy journey.